Having just finished discussing linear interpolation, or motion in a straight line, we next come to circular interpolation, which is motion along a circular arc. 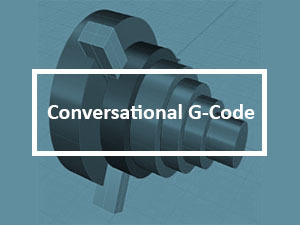 Other than the fairly exotic ability to follow a “NURBS” path, most g-code controllers only support two kinds of motion: linear and circular. 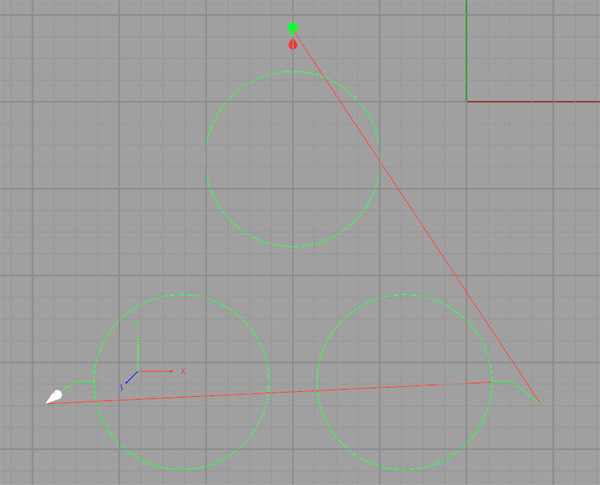 Circular interpolation is quite a bit more demanding on your machine as two axes have to be precisely coordinated. Drawing a complete circle involves not just coordinated motion but reversal of direction at each of the 4 quadrant points. These would be the points corresponding to 0, 90, 180, and 270 degrees. If the machine has any backlash at all, it will be obvious at these reversals because there will be a glitch in the cut there. Like linear motion (initiated by G00 and G01), circular motion is a mode initiated via G02 or G03. G02 establishes a mode for clockwise circular arcs. G03 establishes a mode for counter-clockwise circular arcs. 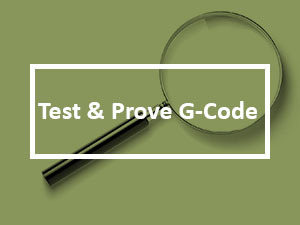 Once either the G02 or G03 mode is established, arcs are defined in G-Code by identifying their 2 endpoints and the center which must be equi-distant from each endpoint or an alarm will occur. The endpoints are easy. The current control point, or location when the block is begun establishes one endpoint. The other may be established by XYZ coordinates. The center is a bit more complex. The I and the J specify relative coordinates from the start point to the center. 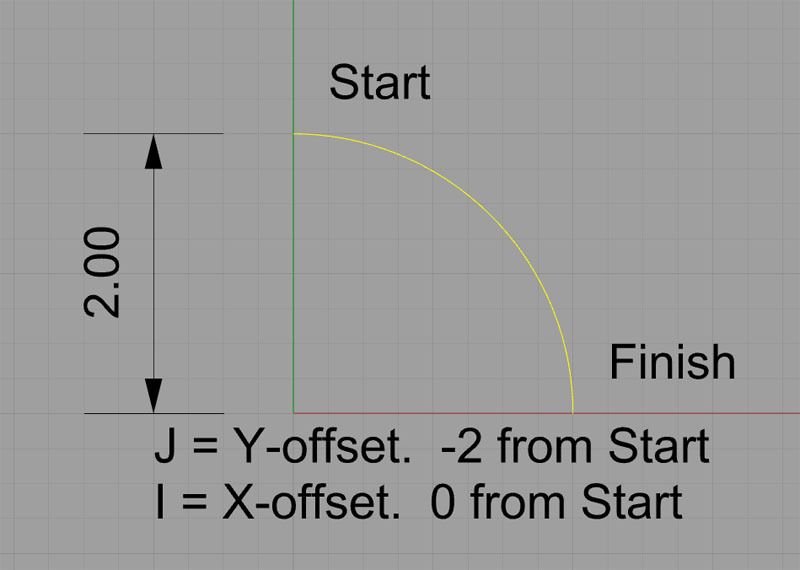 In other words, if we add the I value to the starting point’s X, and the J value to the starting point’s Y, we get the X and Y for the center. Many of you will be deciding right here and now that since R is easier to understand and shorter to write, you’re just going to use R and forget about IJK. But, the CNC teachers in the world will suggest that you should prefer IJK. Their argument is that when you use IJK, you get a double check that your arc is correct. Because the controller gets to compute an actual set of coordinates for the center via IJK. Once it has the center’s coordinates, it can check that it is equa-distant from both end points. The check of each of those two distances is the double check. In the case of the “R” format, the controller has no such double check. It has to chose a center that guarantees equal distance. Personally, I don’t know if I agree with the CNC instructors that this is providing any extra checking or not. I say go with whichever approach makes sense for your particular situation, but you should definitely be familiar and comfortable with both. You’re going to need to be comfortable with relative coordinates anyway, as they’re darned handy. May as well get comfortable now. It’s kind of like being told you should only use the 4-jaw chuck on a lathe when you first start out so you’ll get very comfortable dialing it in. It’s a good skill to be good at as a machinist! This is another one of those places where lots of obscure things happen and you need to know what your controller will do without assuming anything. In general, the rule is supposed to be that if you have both IJK and R in the same block, R takes precedence and IJK is ignored. But there are controllers that don’t work exactly that way, so be sure you know what’s going on. – Incremental vs Absolute IJK: We’ve discussed IJK as offering coordinates relative to the starting point for the center. Add the I to X, J to Y, and K to Z of the starting point and you get the center. Many controls also have the option for IJK to be the absolute coordinates of the center. – Modal IJK Centers: When IJK are absolute center coordinates, some controllers will remember the last center defined, hence IJK is modal in that case. When using a control set up like this, you can just keep issuing XYZ commands for arcs without having to define a new center each time. It’s not clear you’ll save much though–how often do you want to do a bunch of arcs with the same center? – Modal R Centers: Another variation on the modal center idea is to allow the radius defined by “R” to be modal. Whatever the last R used was, the controller remembers and uses that value again if no R is given. This seems more useful than modal IJK. For example, a pocket might have arcs for the corners that are all the same radius. 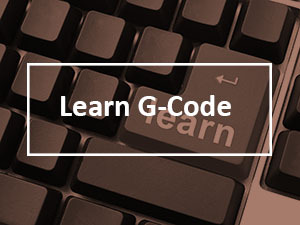 – Give R Precedence: As mentioned, most controllers will use “R” when both “R” and “IJK” are given in the same block. But this option allows you to change that precedence to IJK if your controller works that way instead. – Helical Interp. : This option governs whether your controller allows helical interpolation. If you see that sort of thing, the first thing to check is absolute versus relative IJK for arcs. 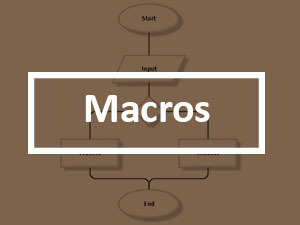 The setting has to match between what the CAM produces and what the controller or simulator expects. Interestingly, you can’t specify a full circle with the “R” notation. This is because there are an infinite number of circles that start and end at the same point of a particular radius, so the controller has no idea what the correct circle might be. If R is negative, it takes the longer path (in yellow). Positive gets the shorter path. Given the two choices shown, the controller chooses the path based on the sign of the radius. Negative forces the longer arc, positive the shorter. The negative sign forces the controller to seek a viable arc of more than 180 degrees. Some controllers are touchier still and will not program an arc that crosses a quadrant line. Hence, the largest angle an arc can follow is 90 degrees, and that angle must not cross 0, 90, 180, or 270 degrees. For angles of 90 degrees that cross a quadrant line, they must be broken into two pieces, with the join between the pieces being right on the quadrant line. When I’m laying out a toolpath, I prefer to leave the arcs until last. In place of each arc, I simply put a line segment whose endpoints correspond to the arc’s endpoints. 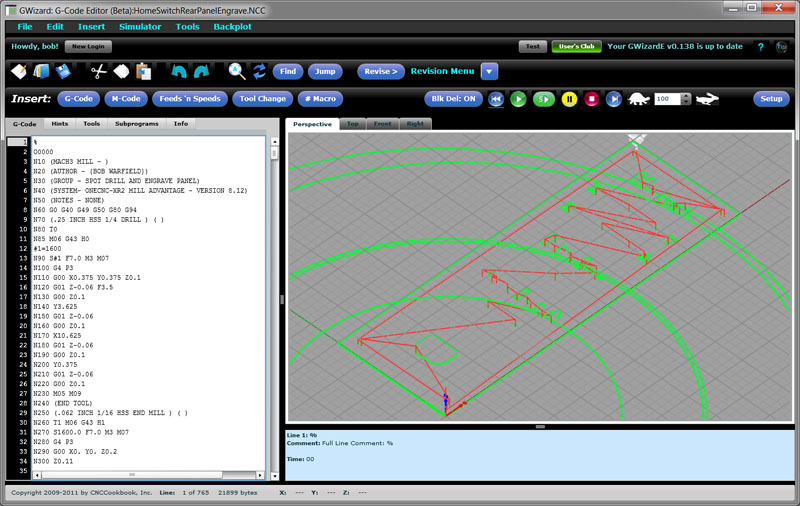 This makes it easy to get the rough sketch of the toolpath together quickly, and it often seems to make it easier to then go back and convert the lines to arcs once the basic structure is already in place. G01 G42 D08 X0.0235 Y-0.0939 F10. G03 X0.1191 Y-0.1191 Z0.0179 R0.1191 F16. G03 X-0.1202 Y0.1202 Z0.0179 R0.1202 F26. 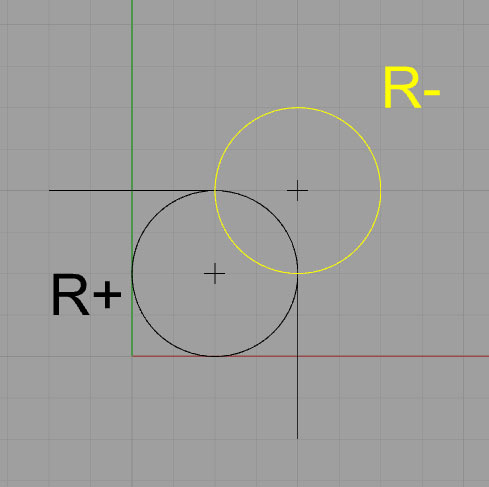 This is “R” (radius) format for the arcs, and note there is a Z coordinate to specify a depth change for the end point of each arc. 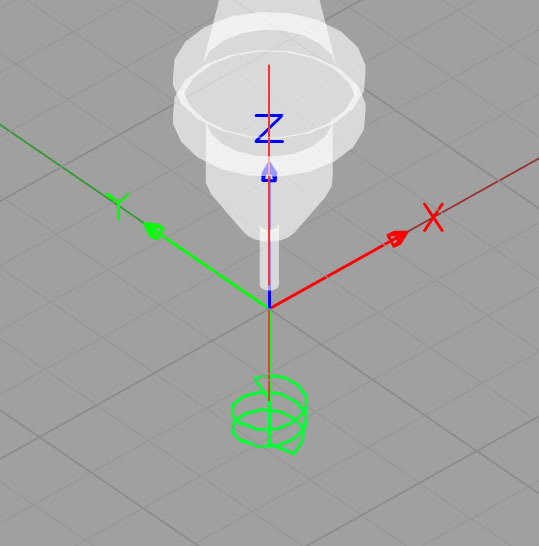 This code uses relative motion (G91), so each “Z0.0179″ moves the cutter 0.0179” deeper. GWE will measure and tell you the helix pitch, which in this case is 0.100″. That can be useful for identifying what sort of thread is being milled. We can also see that this particular arc runs from 270 degrees to a scosh more than zero (0.1 degrees). We’ll revisit thread milling in much more detail in a later chapter devoted entirely to the subject. For now, we just wanted you to be familiar with the idea that you can make helixes as well as flat two dimensional arcs. Whenever the cutter changes direction, it adds a certain amount of stress. The cutter will bite into the material either more or less than it had been, depending on whether the directions changes towards the workpiece (or uncut material) or away from it. Your machine will be much happier if you program an arc rather than an abrupt straightline change of direction. Even an arc with a very small radius will allow the controller to avoid changing direction instantly, which can leave a mark in the finish in the best case and cause chatter or other problems in the worst case. For slight changes of direction, it may not be worth it. But the more abrupt the change, with 90 degrees being very abrupt, the greater the likelihood you should use an arc to ease through the turn. Arcs are also a useful way to enter the cut, rather than having the cutter barge straight in. For information on entering the cut with an arc, see the toolpath page from the Milling Feeds and Speeds Course. 1. 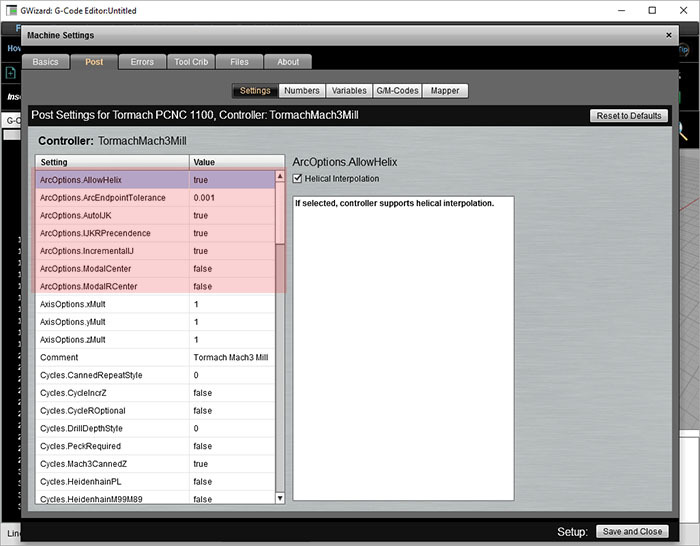 Dig out your CNC controller manual and go through the arc settings to set up GWE to match your control’s way of operating. 2. Do some etch-a-sketch experimentation with GWE. Create some toolpaths that include arcs until you’re comfortable creating them.